Secret Harbour Beach Resort on St. Thomas combines stunning views with a private beach, restaurant, and bar, it’s the only resort we know of in the US Virgin Islands which is home to its own watersports rentals and tour company. Aqua Action (4.5 stars). We loved Secret Harbour even before we saw our room. We got lost looking for the dive shop, and one of the staff, Henry, who was clearly in the middle of something and also heading the other way, stopped what he was doing and walked us to our destination. Later, two staffers also helped us find our way by taking us to our location instead of just pointing. Now that is great customer service. 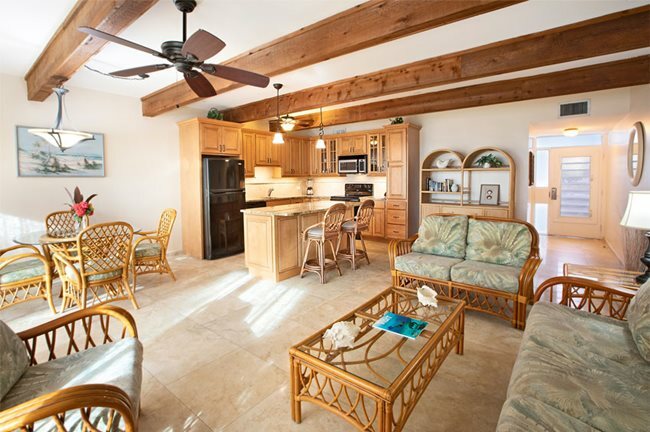 Our condominium-style suite was spacious, with high ceilings and a mirror that made it look even larger, decorated in white, sand, and green beach colors. It was decorated attractively but not garishly, with ocean-themed works of art, statues, and paintings. Delightfully, it also came with two reliquaries. These are wooden boxes hung on the wall, historically with religious intent, that when you open them you discover wonders such as seashells. The room was quiet, as though it had extra soundproofing. It came with white tile floors and a larger porch than you would expect, which directly faced the beach and west to a great view of the sunset over the water. Out on Secret Harbour’s private beach, you can see palm trees, people relaxing, boats in the harbor, and in the distance buildings, mountains, and the ocean. It really is a perfect location. The bed was only midlevel quality, being too firm, and we didn’t have strong water pressure, but the bathroom was large, and had a comfortably sized shower. With the full kitchen, you’re ready to host any party! It features a dishwasher, a sink, a stove, a coffee maker, a refrigerator and freezer, a toaster oven and a toaster, a blender, a microwave oven and a real oven, and plenty of dishware for entertaining. Part of the wall pulls down as an extra bed, so there’s room for an entire family, and there’s a TV, DVD and CD players, and many books. Wild roosters did wake us at dawn, but this is an issue throughout St. Thomas. Our schedule, reviewing many resorts in a single week, didn’t permit us to explore Secret Harbour, but we did take a tour with Aqua Action, their on-site watersports activity center, out to learn scuba diving. They can also take you snorkeling, or rent kayaks, paddle boards, paddle boats, or beach chairs. Or they’ll give you referrals to activities all across the island such as ziplining and hiking tours. You’ll also find a swimming pool, tennis courts, gym, tennis courts, hammocks, and spa services including massages. And we assume there’s great snorkeling right at the private beach. 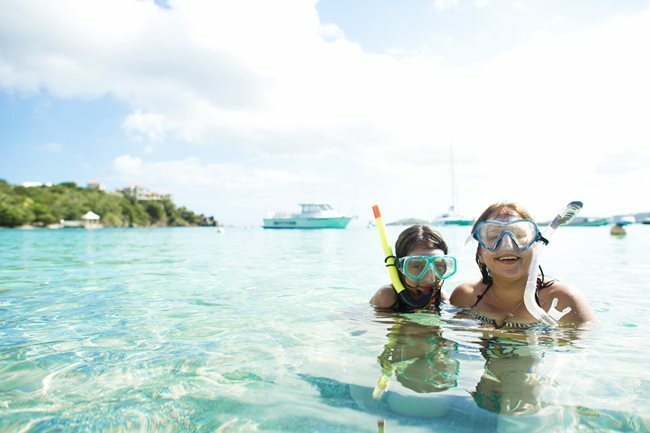 With their watersports center, Secret Harbour offers more activities than any other resort on St. Thomas. The rooms are luxurious without being ostentatious, and their staff work to the highest levels of service. 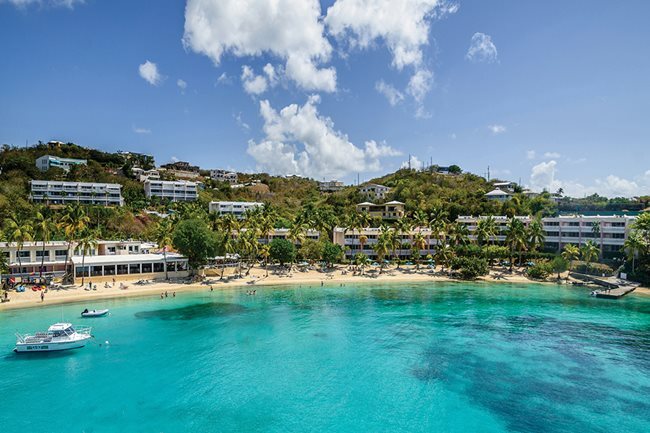 While we didn’t have enough time in our trip to explore Secret Harbour Beach Resort completely, it appears to be the perfect vacation getaway. 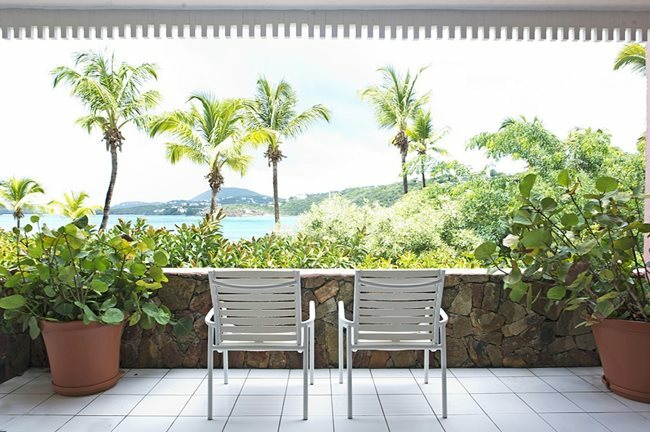 It may just be the best resort in the US Virgin Islands, and easily deserves a full 5 stars. See secretharbourvi.com and our review of their restaurant, the Sunset Grille.